Hello! Hopefully (fingers crossed!!!) some of you are reading this post after it has landed in your inbox. I have finally found time this week to set up an email mailer and I am hoping to bring you an update every Friday with one or two new recipes that I have posted that week. Inspired by a trip to Bangkok last weekend, and with thoughts of Christmas fast approaching, my mind has gone into overdrive this week with recipe ideas, so there will hopefully be lots to bring to you in the coming weeks. In recent weeks I have been taking part in an Instagram photography challenge set by Kimberly, the blogger behind www.thelittleplantation.co.uk. As an aside, if you are interested in tasty vegan recipes and beautiful food photography then do go and check out her blog. During the challenge, we have been set different weekly themes and the first theme of this week was 'Pretty in Pink'. The Mandarin Oriental is my favourite hotel in Hong Kong, I love it's old world charm and fantastic service, and they serve an amazing strawberry rose jam with their scones!! A good scone is hard to find in Hong Kong so a trip to the Mandarin for some afternoon tea is a real treat. 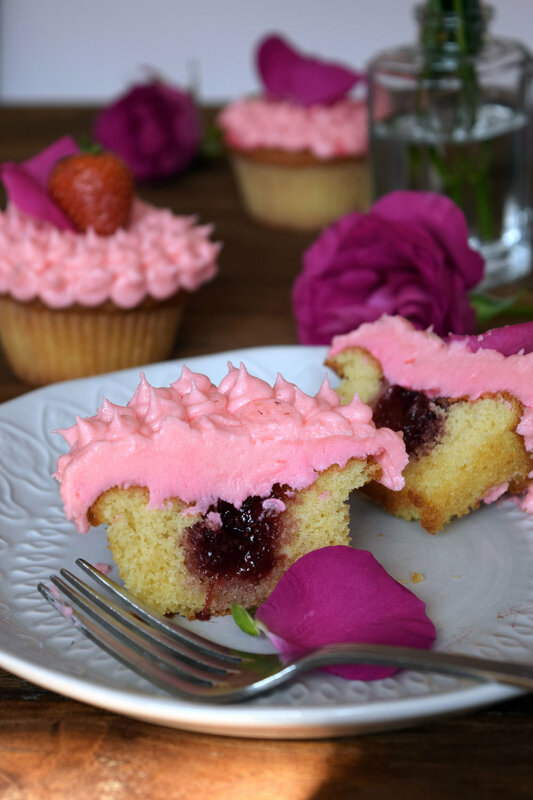 Inspired by that delicious jam I created these pretty pink cupcakes which have some homemade strawberry rose jam hidden in the centre. 1 1/2 Tsp Rosewater. The amount can be adjusted to suit your taste. Firstly make the jam. Put the strawberries, water and caster sugar in a small pan and cook over a low heat for about 30 minutes or until the strawberries have broken down and the mixture has thickened to a jam-like consistency. As the jam is cooking stir regularly and use the back of a spoon to squish the strawberries. Once the jam is ready remove it from the heat and allow to cool. The jam should be relatively smooth; if it is still quite lumpy use a hand blender to blitz it slightly. Once cool stir in the rosewater. The amount of rosewater can be adjusted to suit your taste. I like to have quite a strong rose flavour, if you do not want it to be too perfumed then only use 1 teaspoon or rosewater. Whilst the jam is cooking you can also make the cupcakes. Preheat the over to 170 degrees centigrade. Prepare a 12-hole muffin tin with paper cases. Cream together the butter and sugar until light and fluffy using either a freestanding electric mixer, an electric hand whisk or by hand with a wooden spoon. In a separate bowl beat the eggs together with the vanilla extract. Gradually and slowly add the eggs to butter and sugar mixture whilst the mixer is still running. Sift the flour and baking powder together and then fold into the wet mixture. The mixture should drop off the spoon quite easily but if it seems too thick add a little milk. Spoon the mixture into the paper cases and bake in the middle of the oven for 15 - 20 minutes until the cupcakes are springy and a skewer inserted into the centre comes out clean. Remove from the oven and allow to cool for 10 minutes before removing to a wire rack and letting them cool completely. Make the frosting by beating together the butter and icing sugar until totally combined. With the mixer on a slow speed gradually add the milk and vanilla extract*. Once all combined mix on high speed for about 5 minutes until light and fluffy. Add food colouring to achieve your desired colour. Once the cupcakes are cool prepare a piping bag filled with the strawberry jam. Using the tip of a knife make a small hole on the top of each cupcake in the centre. Using the piping bag pipe a small amount of the jam into the centre of each cupcake. Pipe or spread the buttercream frosting on top. * I did not do this, but next time I am planning to try adding a couple of tablespoons of the jam to the frosting and decreasing the amount of milk. If this works out well then I will update the recipe.